Imagine a waiting list of 100,000. On it are people whose legs never existed, never worked right, were destroyed by accident or just plain wore out from grueling physical labor. People with eager faces, others who barely dare to hope, all waiting to be lifted up. 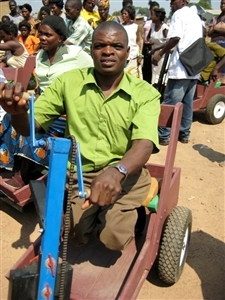 PET Project, Zambia, gives away about 50 hand-cranked mobility carts each month. Plans are to double that output this fall. A man who has lost his legs can move across country again, thanks to a PET mobility device. Photos from New Life Center, Zambia. And that list covers just one corner of the world, a place in Africa called Zambia. There are other lists, just as long, in less-developed countries in Asia and Central America, places where land mines, polio, birth defects and animal attacks leave people unable to walk in regions where walking is the only way to get around. Rev. Delbert Groves, a Florida Conference missionary assigned to Zambia with his wife, Sandy, has seen the faces behind the names. He remembers a 13-year-old boy whose paralysis from illness affected all of his limbs. Groves gave him a special wheeled device called a PET, or Personal Energy Transportation, that offered a way for him to get around without being carried. The boy was accompanied by his parents and sister. Groves also recalled a young man who had a job in one of the mines and was making plans to get married. He was walking along a railroad track from the mine to his village with his pay in his pocket when he was beset by robbers who beat him and left him unconscious. The attackers cruelly left his legs draped over the tracks, where they were severed when the next train came along. "All kinds of things like that happen over here," Groves said. 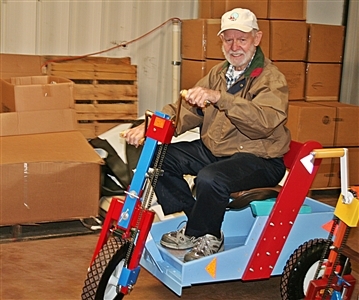 Retired missionary Larry Hills wheels a finished mobility cart into place at the PET Project facility he founded in Penney Farms. Photo by Susan Green. Zambia's PET Project traces its beginnings to retired missionary Larry Hills, who helped develop the heavy-duty devices and founded a PET Project plant in Penney Farms, Fla., where he retired after 33 years in Zaire, now called Congo. Click here for more photos. While in Africa, Hills saw plenty of injustice and poverty, but the sight of people crawling or dragging themselves on the ground tugged at his heart more than anything else. Worse, many who ventured outside their homes were shunned or spat on in a culture that believes such bad luck as loss of limbs can spread to others. In societies where walking is the primary mode of transportation, people with withered or severed legs were, at best, a burden to others. Hills referred to Matthew 25, where the righteous and unrighteous are distinguished by their willingness to help "the least of these brothers and sisters." "I thought, there wasn't anybody 'leaster' than these folks, and we ought to be helping them," Hills recalled. How to help posed a dilemma. Traditional wheelchairs wouldn't suffice because they wouldn't stand up to the rough terrain and primitive dirt roads of the developing world. In 1995, Hills teamed up with a friend in Missouri, Rev. Mel West, and a young product designer named Earl Miner to create a sturdy, hand-cranked cart on three wheels. The first prototype was given in 1996 to a fisherman who lost a leg to a crocodile, Hills recalled. 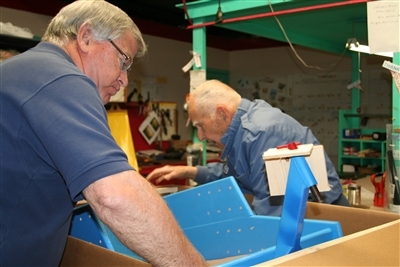 Above, volunteer Ted Emack of Leesburg places the seat of a PET mobility unit in a box for shipping as Ron Seaton works in the background. Below, former missionary Sid Rooy, a longtime volunteer at PET Project Penney Farms, talks about how the unit will be assembled. Photos by Susan Green. Since then, the PET design has been modified a few times, but it remains a relatively simple conveyance that can be partially assembled, boxed and shipped to developing countries where final assembly and distribution occurs. 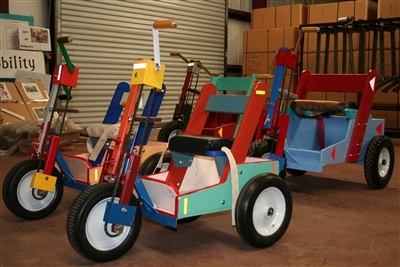 The vehicles come in adult and child sizes and there's one called a Pull PET for people who don't have use of arms or legs but have family or friends that can pull them along in a cart. Today, about two dozen PET assembly sites exist in the U.S., including three in Florida. Local churches often help with more than donations. 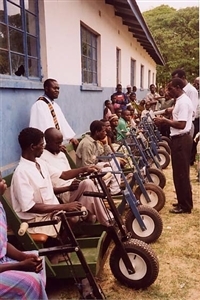 For example, Keystone UMC near Penney Farms has a workshop where volunteers do partial assembly of PET vehicles and St. Andrew's UMC, Brandon, provides a place for parking and loading of a tractor-trailer that carries steel and wood needed to make PET carts in Zambia, the only PET facility outside of the U.S. Altogether, the PET sites have produced and distributed more than 38,000 of the specialty vehicles in 100 countries, according to PET International Inc. About 700 to 800 are produced each year at Penney Farms, and the New Life Center mission in Zambia is hoping to double its output from 50 to 100 per month later this year. Building and expanding the mission has not been without obstacles, but Hills said he never really doubted the idea would bear fruit. "The Lord got hold of it and it exploded," Hills said. He retired from the PET board in 2010 but still reports occasionally to the warehouse and assembly facility he founded in the Penney Farms retirement community. He and his wife, Laura, settled there after leaving mission service in Africa in 2001, and there he trains volunteers interested in opening new PET facilities in order to increase the output. 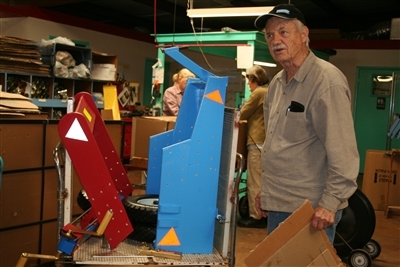 Many of the materials needed to make the PET units are donated, and assembly depends entirely on volunteers. Barbara Chase, volunteer office manager at the Penney Farms facility, said it costs an average of $250 apiece to ship the partially assembled carts to ports for distribution. Although each PET is assembled according to a pattern and parts are designed to be interchangeable, the seats and boards are painted in different rainbow colors so that no two are the same. "Bright things bring a bright spot into their [recipients'] lives," Rooy said. "And every one is different, so when you get one, you're unique in your village." For recipients in Zambia, that aspect is more important than an American might realize, said Delbert Groves of New Life Center. "When they get a PET from the U.S., it changes their whole social status," he said, adding that often they are no longer shunned as having "bad juju." "Somebody in America loves this person. God loves this person." 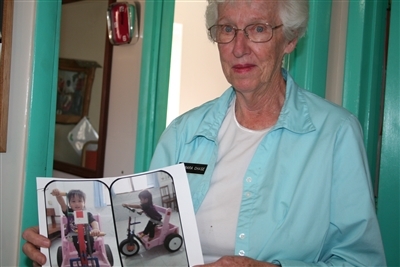 PET Penney Farms volunteer Barbara Chase holds a photo of a little girl who can get around with the help of her PET mobility device. Photo by Susan Green. Joe Harless of Valrico, a member of St. Andrew's UMC, is the volunteer procurement officer for PET Project Zambia. His most recent shipment in May included 14,000 pounds of steel and 1,500 tires, as well as 100 boxes of Bibles and other books. "It's a wonderful calling for all the folks who are involved in it," said Harless, who remembered seeing one recipient crawl along a ditch to New Life Center, his approach signaled only by a bobbing head. It turned out to be a man whose legs were blown away by a land mine. "When you pick up somebody who doesn't have any legs … it's a heart ripper, I tell you," Harless said. "When someone crawls in and you put them on one of these [PETs], it's giving them a new life." * PET Zambia video by Icel Rodriguez, Global Missions director for the Florida Conference. Click here to see her blog about a recent trip to New Life Center, Zambia.